Last week, Expedia sent me an urgent e-mail. Apparently, the hotel that I’d booked for our stay in Dusseldorf — the same one that Expedia had confirmed six weeks ago — was closed. A phone call with an apologetic customer service rep offered a “comparable” alternative: the Hilton Garden Inn. This obviously wasn’t going to cut it. I explained to the rep that rates had all gone up since we had made the booking and “comparable” now would be much more expensive. He said that he understood and wanted to find an agreeable solution. “Where would you like to stay sir?” he asked me. The InterContinental, I replied. “Please hold,” he said. A few minutes later, he came back on the line. The rate at the InterContinental was $615 per night; but because the mistake had been made by Expedia, the company would cover the difference. And, on top of that, my account would be credited $100 for the inconvenience. Okay. Flash-forward to this morning, when we arrived in Dusseldorf, the wealthiest city in Germany, which is itself one of the richest countries in Europe. We returned the car at Avis and rolled our bags down the Konigsalle (or “Ko”), a picturesque street lined with every designer shop imaginable and separated by an ornamental canal. At the InterContinental, we were met by a top-hat wearing doorman who led us into a lobby with a soaring atrium ceiling — beautiful, bright and elegant. This place was all class. We took the glass elevator up to the ninth floor and took a look down into the lobby before heading to our suite. With zebra wood walls, obscenely high thread-count sheets, a separate living room and sweeping views, this would be the dankest accommodation of the trip. We hadn’t had breakfast yet so the concierge recommended Bastian’s, a popular brunch spot in Karlplatz. Our first eggs of the trip were perfect — omelets with gouda cheese — and we loved the freshly squeezed orange juice and bread baked on site. 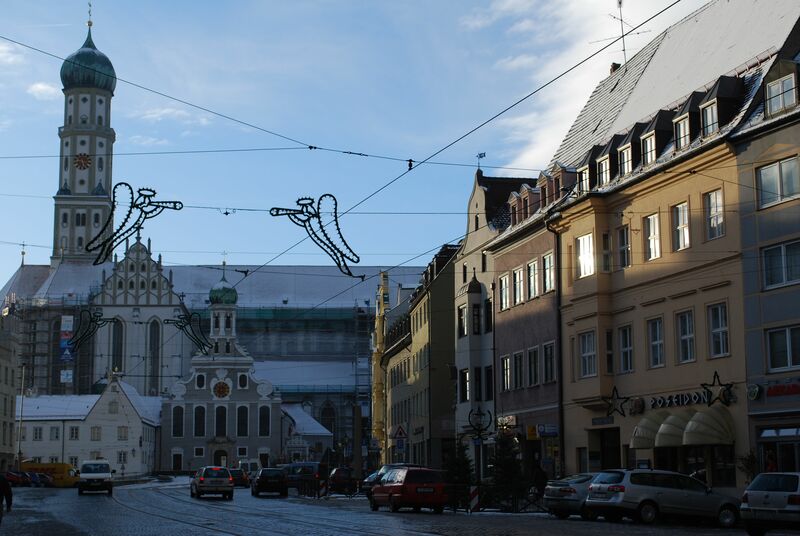 Much of this city was destroyed in the war except for a few buildings in the Altstadt, or Old Town. Through the largely quiet pre-Christmas Eve streets, we made our way there next, scoping out the marketplace and town hall. From the old Dusseldorf, we walked to the new Dusseldorf — the MedienHafen district. In the 19th century, this area along the Rhine was home mainly to warehouses. Today, it has become a showcase for modern architecture; the most amazing is a cluster of buildings designed by Frank Gehry. The Rhine Tower sits off in the distance. Back at the hotel, we warmed up and then, like good Jews on Christmas Eve, went out for Chinese food at Jin Ling, which was surprisingly good. Back at the hotel, we all wanted ice cream but assumed that every place in the city had to be closed. We rang the concierge who called back 10 minutes later. She had found one restaurant within walking distance that was open and served ice cream. We set out early this morning for the longest drive of our trip, a 3-hour journey north to Cologne. Cologne, the largest city in the Rhineland, traces its history back 2,000 years. Largely devastated in World War II, it has been rebuilt into a bustling and beautiful modern day city. The drive was relatively uneventful until we were in the city center and our GPS system bugged out. This might have been caused by the fact that our accommodation — the Dom Hotel — was located on a pedestrian walkway, just a stone’s throw from the famous Cologne Cathedral. Yet, with twisting streets and maddening traffic, we could not figure out how to get there. Getting desperate, we turned up a one-way street to be met by two police officers. “30 euro fine,” one of them demanded. “Sorry,” we replied. He looked at me, looked at his partner, and let us off with a warning. Finally, we decided to park the car and walk to the hotel. Our persistence paid off. The hotel lobby was beautiful and the staff let us know that they were at our service. But it wasn’t until we were up in our room did we truly experience the place. Here’s the view from our windows toward the square and up at the cathedral. Starving, we made a beeline for the Christmas market, just steps outside the hotel and, thankfully, not closed until tomorrow. Visiting such a place while really hungry is never a good idea — we were beyond indecisive before we simply started eating everything. There were delicious thick ham and slaw sandwiches on baguettes; humongous potato pancakes with applesauce and garlic cream; and super duper sausages that Peter demolished. Properly fed, we took a couple of baby steps to massive Cologne Cathedral. 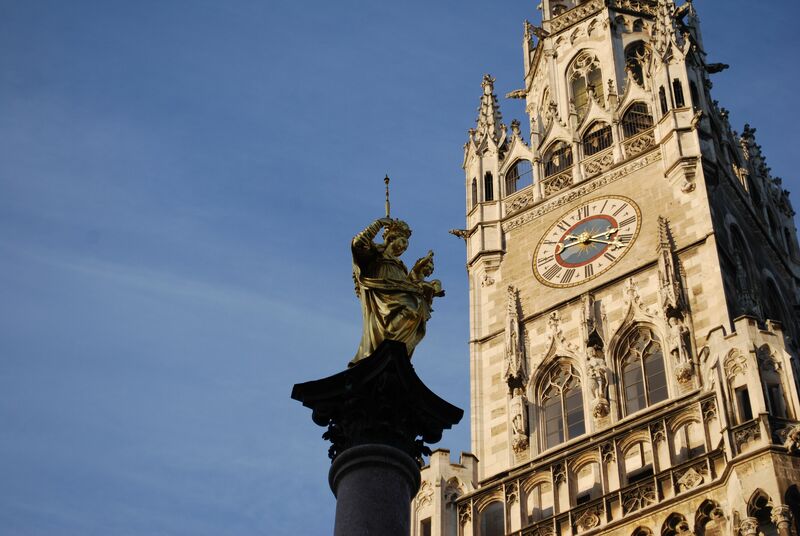 It’s the largest Gothic cathedral in Germany and the second largest cathedral in the world — after St. Peters Basilica. Construction began in 1248 and after several starts and stops, was completed in 1880. Photos fail to put its size in perspective. In fact, it was impossible to get a photo that took it all in. We walked around the massive interior, taking in the soaring ceilings and colorful stained glass. To burn off lunch, we began our claustrophobia-inducing ascent to the top. Around and around we went up the tight spiral staircase, stopping to check out the ginormous bells before the last leg up an open staircase. Not good for vertigo. But the views were spectacular. Back on terra firma, we joined the masses and cruised the main shopping drag. Unfortunately for us, the prices were in Euros and a bit more difficult to stomach. Instead, we retreated to the hotel and relaxed before dinner — at a surprisingly good Italian place called 12 Apostles. Thin crust pizzas and local beers all around. We grabbed a couple of pastries from the bakery across the street for our 2-hour drive this morning through the Black Forest. The weather was about as nice as a European winter day gets: clear blue skies and temperatures hovering around 45 degrees. Cruising the autobahn, we experienced the German’s notorious driving etiquette. Cars certainly moved faster but the drivers were smart and courteous. No slow movers in the left lane or reckless weaving — basically, the exact opposite as back home. On the outskirts of Stuttgart, a Mercedes-Benz logo rotated like a beacon in the sky. It was the first of many we would spot in this city, which is home to headquarters to both Mercedes-Benz and competitor Porsche, as well as their sleek and shiny museums. Given our mode of transportation, we started at the Mercedes-Benz Museum, a wavy silver box whose undulating curves gave the impression of movement. After an elevator to the sixth floor, we started in 1886 with the world’s first four-wheel automobile. From there, we worked our way downward, exploring decade after decade and watching the evolution of the Mercedes. Some of the coolest of the 75 cars were from the 1930s, 40s and 50s. Off of each floor was a separate wing with other Mercedes vehicles, like its buses and Pope Mobiles. Unfortunately, we weren’t allowed to board the latter. Downstairs, we checked out some of the Mercedes race cars — including the Blitzen-Benz, the Silver Arrow and the Indy car — before grabbing a surprisingly good lunch of schnitzel and maultasche in the café. Peter rocked the meat dumplings but said, for the record, that he prefers spaghetti bolognese. From Mercedes, it was a 15-minute drive across town to the Porsche Museum, completed just this January. From the outside, it was another modern beast with lots of glass, steel and mirrors. As we were waiting to buy our tickets, some friendly German fellow came over and offered us his unused ones — we danke’ed him and made our way upstairs. The museum was much smaller and provided less history but with around 80 cars on display, was impressive no less. Alex got me hanging out with this hot 911 GT1, a “supercar” that is apparently kind of a big deal. We also checked out a new Panamera that had been cut in half. Alright, fine, Porsche, you win. Your cars rock and we all want one! Back at another Le Méridien, we checked in and settled into our comfortable room. The gorgeous spa was about deserted so we took over the fitness center, sauna and steam room. The concierge suggested dinner at Alte Kanzlei, a contemporary restaurant serving updated traditional German cuisine. Between the schaufele and the rostbraten, washed down with a bottle of Lemberger wine, we don’t think Swabian cuisine could get much better. Tomorrow, we continue northward to Cologne.